The earthquake that devastated Haiti in 2010 also destroyed much of the country’s infrastructure, meaning that people struggled to get hold of essential needs. 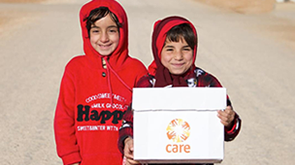 CARE had to find innovative ways to support them – and help rebuild local economies at the same time. CARE was one of the pioneers of using mobile phones to enable rural communities in Africa to access financial services – such as our partnership with Vodafone in Tanzania to set up M-Pesa, a money transfer and micro-financing service which allows users to deposit, withdraw and transfer money using a mobile phone. But in remote areas of Haiti like Grand Anse, Artibonite and the North West, many of the poorest people do not possess a mobile phone, so this system alone could not be used. So CARE came up with the idea of combining mobile money technology with electronic vouchers or cards. People are supplied with electronic plastic cards which are more durable and long-lasting than paper vouchers. They visit a local agent who uses a mobile phone to top up the cards with funds – overcoming logistical problems in issuing paper vouchers to the vulnerable and food-insecure populations in remote regions. People then use the funds on their cards to buy fresh local produce from market vendors who can deduct money from the cards as payment for their goods – thereby ensuring vulnerable people have access to fresh, healthy food, and giving a welcome boost to the local economy at the same time.